This is a very exciting time for me right now. My first book, will be released soon and it just showed up on ! It has been a very long road to get to this point. Given that I work full time, have a family with a wife and three kids, do small-time I.T. consulting for a few SMB’s, volunteer with my community church, head up a (and go to meetups for other I.T. Pro groups as well), maintain a , and I still make time to read and learn new skills, I am amazed that even with all of these things going on in my life that I was able to complete this book. How I came to write the book started with a small project at my job. 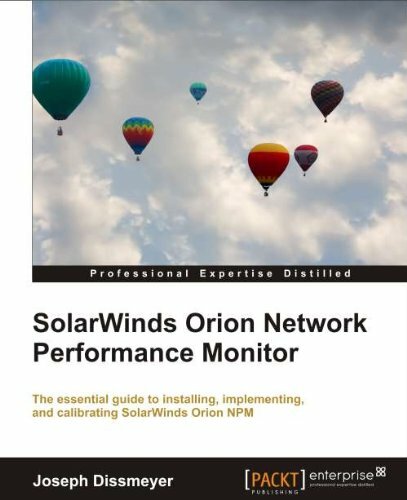 We needed to upgrade our SolarWinds Orion NPM installation to resolve some issues we were having at the time, as well as to include support for some new gear we were monitoring. Long story short, the upgrade documentation was impossible to understand. I ended up doing the upgrade on my own and to by surprise was VERY easy to do. I posted the steps how to do this. A few days after the article was posted, someone from asked if I would be interested in writing the book on Orion NPM. I already have a knack for writing documentation, and I somewhat enjoy writing anyways (Have you seen the articles on this site yet? lol) After a week of communication back and forth between the publisher and myself, and with a lot of prayer asking for guidance, I made the decision to write it. It took 10 months, but the book is finally here! There are three primary reasons why I wrote the book. First, there is the obvious need for some additional income, and the second reason was to set straight some inherent problems with the vendor’s official documentation. But third, above all else I wanted to prove myself that I really could write a book. I already had a knack for creating documentation but I really didn’t know if I could write an entire book. I thought about writing before but I never knew how to get started and nothing ever came to fruition. During ‘decision week’ where I talked with my wife asking for her opinions about writing, talking with my colleagues and friends what they thought about me writing a book, everyone was very encouraging. But it was one person that told me, “Joe, if you write this book it will open up a whole bunch of new doors in your career for you. I know that you can write it and it will be amazing. Do it.” That was the one that finally pierced through my doubts and right then I made the decision to write the book. If that person didn’t tell me to write it, I probably would have dropped out. I had to meet deadlines, of which were fairly lenient in my opinion, and I stuck to it. I was able to write the book while working around my normal time schedule. I never missed out on spending time with my family, was still able to work my side-jobs, never had to pull back on volunteering with my church, I still attended IT pro groups, still had a vacation, went to theme parks, and still watched my favorite TV shows. Sure, there were some nights where I only got 3 to 4 hours of sleep, but when you are “in the zone” it is difficult to stop! There were only a few days during the entire course of writing the book that I needed someone to watch my kids on a Saturday so I could type as much as I could, but that was pretty much it. I know that not everyone is supposed to write a book, but if there is one that you are thinking of writing why not give it a try? I was able to do it without sacrificing my personal life and I am very happy with the outcome of the book. A book release can be very beneficial for your career and will help your confidence. My experience in writing my first book was a positive one and I already want to get started on my next project. For those that are wanting to start writing, are on the fence, or are in doubt, I hope this article will help you in making your decision.